the ability to control odors. the special features they offer. There is plenty of room for the cat to comfortably use the bathroom within the 22”L x 17” w x 18” h measurements. The door opening is also plenty big enough, measuring 10.4” x 9.6”. The large hood lifts up so the cat owners can easily access the cat litter box to clean it and add more litter. The carbon filter helps remove odors which are very prevalent with cat boxes and replacement filters can be purchased separately. The integrated bag anchor keeps the bag pen so you can scoop out the messes easily without having to hold the bag too. 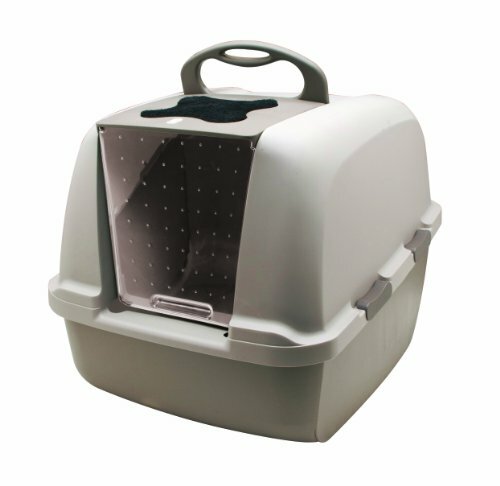 This cat litter box is perfect for households that have multiple cat boxes. Although it may sound like a dream come true, the Omega Paw Self –Cleaning Litter Box is real and it works well to clean the cat litter box without the cat owner having to actively scoop messes. The waste that is collected by rolling the box to the right until the top touches the floor and then rolling it back to where it was, gets deposited into a scoop that is easily pulled out and dumped. There is no filter or electricity needed for this cat litter box. It is the perfect box for larger cats or multiple cat homes. The design of this cat box controls dust and contains odors so it is not making your house smelly too. Using the Omega Paw Self Cleaning Litter Box saves money and time. Less clean litter is thrown away because the scoop only collects the clumped litter. It is the perfect cat litter box for the cat owner who hates to clean the box but doesn’t want their house to smell. Nature’s Miracle Advanced Hooded Cat Litter Box has superior odor control due to the advanced plastic technology that is used in its construction. This odor blocking plastic prevents odors from being absorbed by the plastic and causing an ongoing problem. It also resists the growth of odor causing bacteria. The Ionpure antimicrobial protection keeps bacteria from being able to grow on the surface. All of this means fewer odors from the cat litter box and happier cat owners. Clean up is easy thanks to the non-stick surface that gets rid of the problem of cat litter caking up and sticking to it. The hood of the cat litter box has 4 latching side locks that keep it in place and the charcoal filter absorbs even more odors and lasts up to 3 months. This may need to be changed more often if multiple cats are using it. This cat little box even has style to it with the black base with gold flecks that looks great no matter what the décor of your home is. Cleaning the cat litter box will not be the hassle it can be with this cat litter box from Nature’s Miracle. Cats like to keep themselves clean and they won’t use a dirty cat litter box. With these three top rated cat litter boxes, you won’t have to spend a lot of time keeping them clean because they are all designed to making keeping the odors down and making the cleaning process simpler for the cat owner. If you have not made up your mind yet about the kind of cat litter box you want, take a look at our buyers guide below that goes over the features and information you need to choose the cat box that will be the best for your home and cats. This information is designed to help make sorting through all of the choices much easier. What is a Cat Litter Box? A cat litter box is a box that is filled with cat litter and is placed in a spot in the home for cats to use the bathroom. There are many different styles and designs of cat litter boxes on the market. The cat owner has choices from the basic cat pan to the more advanced and fully featured, self-cleaning variety. Which one you choose depends on several different factors including how many cats you have and whether they are indoor only or both indoor/outdoor cats. There are several things you need to think about when deciding on the right litter box for your needs. We have outlined the most important considerations a cat owner needs to make when they are considering purchasing a new cat litter box. In this buyer’s guide you will learn about the different types that there are as well as which type of litter box is best for specific situations. There are several different types of cat litter boxes available to choose from. There are open-top varieties, covered, self cleaning and others as well. We have separated the different types of cat litter boxes so you know the differences between them. 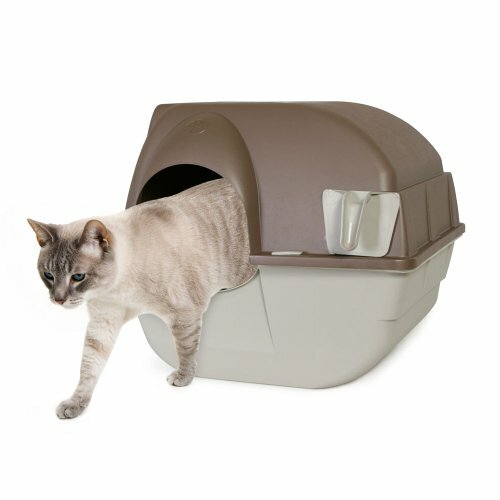 Open-Top Cat Litter Box – This traditional litter box comes in the shape of a rectangle and is the least expensive of all the different types. It has not frills other than sometimes having a rim that will hold the liner in place. They come in a variety of colors and are made of plastic. They also come in different sizes from the very small that works for kittens just starting out, to the extra large that is good for multiple cat homes. 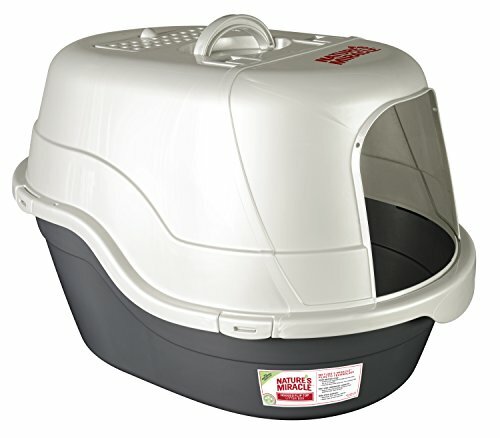 Covered Cat Litter Box – This type of litter box looks just like the open top variety except it has a top that connects to the bottom. The purpose of covered cat litter boxes is to offer the cat privacy and these boxes also help with controlling odor since they are contained. There is a hole on one end of the cat box so the cat can go in and out of it. Sometimes these doors are open and sometimes they have little flaps on them to cut down on odor even more. The top is easily removed to allow access to the bottom for cleanings. Self Cleaning Cat Litter Box – This type of litter box is great for making clean up much easier without having to mess with scooping the cat box several times a day. Most of the time there is an electronic rake that scoops all the clumps by itself into a holder that is able to be removed and dumped as needed. Hidden Cat Litter Box – These cat litter boxes are shaped like pieces of furniture or planters and allows cat owners to hide the cat litter box. This is a great choice for cat owners that are sticklers for having a home that does not have a cat box visible. Sifting Cat Little Box – Sifting cat litter boxes make cleaning much easier. There is a secondary container that fits in the main cat box that allows the cat box cleaner to sift through the cat litter and lift out the clumped litter and messes. The size of the cat little box you get depends on the size of the cats that will be using it. Kittens may have a hard time getting into a regular cat litter box if the sides are too tall so you may need to purchase a couple of different sizes to accommodate the kitten as it turns into an adult cat. The general rule of thumb is to get a cat box that is at least 1.5 times the size of your cat. A large cat needs to have the space to get into the box and maneuver around. If they are cramped they will find somewhere else to go. Below are the usual cat litter box sizes and the situations they are best suited for. Small – Small cat boxes are perfect for small cats and kittens. The sides are lower and easy for a little cat/kitten to climb into and out of easily. Medium – A medium sized cat box is a good general size for most single cat homes. Unless the cat is large, this size will work well. Large – Depending on the cat or if you have two cats, a large cat pan is a good size to purchase so the cat owner isn’t having to constantly clean the cat box. Extra Large – This is a great size for oversized cat breeds and homes that have 3 or more cats. Extra large cat pans have plenty of room for the cat to use the bathroom and due to the extra size, won’t have to be cleaned multiple times a day. It will have to be cleaned at least once a day if there are several cats using it on a regular basis. How Many Cat Litter Boxes is Enough? If you have several cats, you may be wondering how many cat boxes you need to have in your home. A good amount is typically one main cat box per cat plus one extra one. Also make sure that if you have a home with multiple floors that you have a cat litter box on each floor. Some cats will not use a cat little box that other cats have used but it depends on the personality of the cat. If they were raised together then they will more than likely not have an issue using the same box. Having an extra one or two cat boxes, helps prevent one from becoming a mess quickly and requiring multiple cleanings every day. There are good places and bad places to put a cat litter box. You want to keep them out of areas that have a lot of activity for several reasons. Keeping the cat box out of high traffic areas helps with unwanted odors being present in the main part of the house. In addition to that benefit, the cats won’t avoid using the cat litter box because they want to have their privacy. If they are nervous about using the cat box because a lot of people are moving around, they will go elsewhere even if it isn’t where they are supposed to go. If you have multiple cats, place the cat boxes in different areas, not all in the same place. They don’t want to use the cat litter box with an audience, even a cat audience. So giving each box its privacy is a good way to make sure that they continue to use it. Below we have outlined some tips that you can use to properly care for your cat’s litter box. Don’t put the cat litter box in a small, cramped space. If your cat has to work to get to it or into it, they will choose not to use it. Clean the cat litter box every day. If you have more than one, clean those as well. Keeping those cat litter boxes clean will encourage the cats to always go where they are supposed to. If you are replacing or changing to a new cat litter box, place the new one next to where the old one currently is. This is a great way to let the cats get used to the new box. Don’t just switch them out or the cats may refuse to use the new one. Make sure that the cat litter box or boxes are easy to get to and clean. You will be doing this every day, so you don’t want to have to fight to get to it every time. If you want to clean out the cat litter box only use a mild soap and hot water. Using cleanser that has a strong smell can discourage the cats from using it because they don’t like how it smells. When you are deep cleaning the litter box, the steps are simple to ensure that it is done in such a way that the cats will come back and use it again. All you will need is some rubber gloves, hot water, mild soap, rags and vinegar. We’ve outlined the simple steps below to ensure a deep cleaned cat box. Make sure you wear rubber gloves when you are cleaning out the cat little box. This protects your hands from bacteria and contamination but it does not replace washing your hands so be sure to do that after you are done cleaning the cat box. Scrub the entire cat litter box (after emptying all the cat litter out) with hot, soapy water and rags. Be sure to get the dried feces and litter off the sides of the cat litter box. If your cat box has a hood, be sure to scrub that one as well. Rinse the cat little box thoroughly after you have scrubbed it down. You don’t want there to be strong soap odors present or it may deter the cats from using it. For strong odors, fill the cat litter box with a half inch of vinegar and swish it around the cat box. Let sit for 30 minutes. After 30 minutes, discard the vinegar and wipe the cat box dry with a clean rag. After the cat litter box has been washed thoroughly and rinsed you can either air dry it or wipe it dry with a clean, dry rag. Refill with your favorite brand of cat litter. Since being comfortable in their cat litter box is an important thing for a cat, you want to be sure that you get a cat box that is big enough for them to get into and move around comfortably in. In this buyer’s guide you have gotten information on choosing, the different types, the different sizes and how to clean them as well. With all of this information PLUS the three top rated reviews you have all the information you need to make an informed decision as to the cat litter box that is best for your home and cats. Getting a cat litter box that your cats will definitely use is important for living in harmony with your cats. No one wants cats that use the bathroom everywhere they are NOT supposed to. Take these suggestions, tips and purchase information to make a great decision on a cat little box that your cats will use regularly and keep your house odor free.